You’ve heard it before; it’s the CarePortal motto: Every church doing a little. It’s a God-inspired vision of local churches working with local workers to care for vulnerable children in tangible ways. In the United States, this vision evolved into a scalable technology platform in which child welfare agencies and local churches could engage and collaborate. This mobilization of the church and state, in many ways, happens through the ordinary tools of modern life: an email. In other parts of the world, this God-inspired vision has taken different shapes. This reality is a reflection of the inherent circumstances unique to each geography. To simplistically apply the orphan care model in one country to another area of the world would be to ignore some of the very reasons that resulted in the orphan pandemic. Yet, despite the differences in geography and circumstance, one fact remains the same: God’s people [the church!] are called to be the light of the world. So, in every area of the world in which we work, the vision is always the same. We work to bolster the church so that it may be the light of the world. In 2 Corinthians 8:4, the Apostle Paul notes that the churches of Macedonia were “begging earnestly for the favor of taking part in the relief of the saints,” despite the extreme poverty that they themselves were enduring. Without assuming that we are giving out of extreme poverty, we do consider it our joy to support the work of the saints around the world as they strive to care for the orphaned and abandoned children in their stead. Similarities in the CarePortal model – as displayed on the The Grid – also exemplify the larger GO Project mission. The Global Orphan Project is not just an orphan care ministry: it is an orphan prevention ministry. Globally, our orphan prevention efforts center on education and economic development. You may not know that we have constructed and currently sponsor schools around the globe because access to education is one of the primary incentives for struggling parents to spawn the preventable economic orphan. 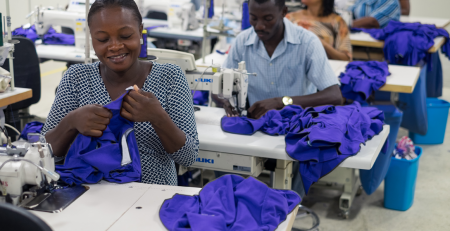 Or, you may not know that we operate an apparel (t-shirt) production facility in Haiti that is designed to provide living wages to its employees and prevent a parent’s horrible dilemma of choosing between child abandonment and child opportunity. Opportunity, by the way, may simply mean a guaranteed meal for the day. We sponsor these schools and we manufacture these t-shirts because we cannot disconnect orphan care and orphan prevention. Shall we be in a constant pursuit of effect without stopping to consider cause? Rather, we recognize that the orphan pandemic requires a comprehensive response, regardless of geography. Each CarePortal response, each donation, each t-shirt purchased: all are acknowledgements of the dignity of our brethren. For those involved with the CarePortal, it comes back to some simple questions. Are you willing to receive an email? And how will you respond to the local need sitting in your inbox? Care to be part of the vision? Wish to learn more about The Global Orphan Project? Contact us here for additional information.